This summer in Poland, two treasure hunters discovered what they believe was a WWII Nazi train filled with treasure, in a buried tunnel. 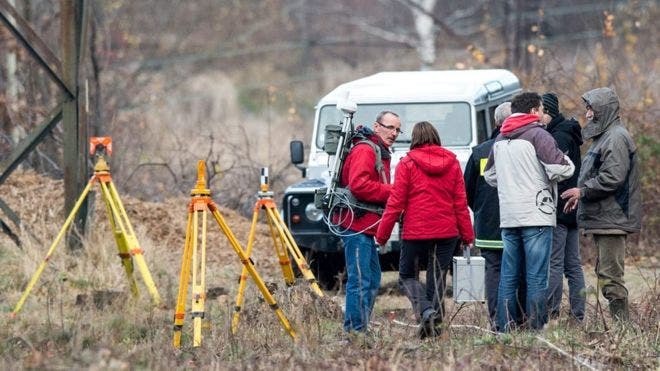 Poland’s Deputy Culture Minister Piotr Zuchowski said authorities were led to the spot and that he was 99% convinced that the treasure had been located. But according to scientists Krakow’s AGH University of Science and Technology, we shouldn’t believe the hype. Geophysicists examining the site of the alleged train. From the very start, there was something unclear about this story. The evidence for the 99% belief in the Nazi train was based on so-called GPR (ground penetrating radar)… except the image they published wasn’t from GPR. I’m not sure what it was from, but I’ve worked with similar equipment in recent years, and have consulted with people who have done so even more – everyone agreed that it’s not GPR. That’s when the first question marks emerged about the validity of the involved science. Now, a team of researchers from Krakow University of Science and Technology came back to look in more detail – using magnetic and gravity measurements. While ground penetrating radar works by emitting an electromagnetic pulse and recording its return, gravity and magnetic measurements measure existing fields. Gravity is suited for detecting large structures and underground voids – as they create a high enough contrast. Meanwhile, magnetic measurements are highly susceptible to metals, so if there were a treasure or some load of guns there, you’d definitely expect to see it. Even if there was a train, it would definitely have lots of metal you would see through magnetics… except you don’t. The team from AGH University was convinced there was no Nazi train. This seems to translate into “we found some kind of buried structure, but there was no indication of anything metallic.” Piotr Koper and Andreas Richter, the two men who claimed to have located the train in Walbrzych, Poland, still stand by their discovery, but the science seems to claim otherwise. “There can’t be a mistake,” Koper said Tuesday, according to the newspaper. Investigations will likely continue in the future, and using more geophysical methods in conjunction with each other could fill in the gaps, because there is always uncertainty with any remote detection method. Drills will also be carried on to directly see what’s down there. Between 1943 and 1945, the Nazis forced prisoners of war to dig more than 9km of tunnels near Walbrzych, probably to be used as factories. However, popular folklore believes the Nazis wanted to establish a secret command centre linked by tunnels to the Owl Mountains south-east of the city. People have been chasing the legend of the train for decades, and apparently, they’ll have to keep looking.